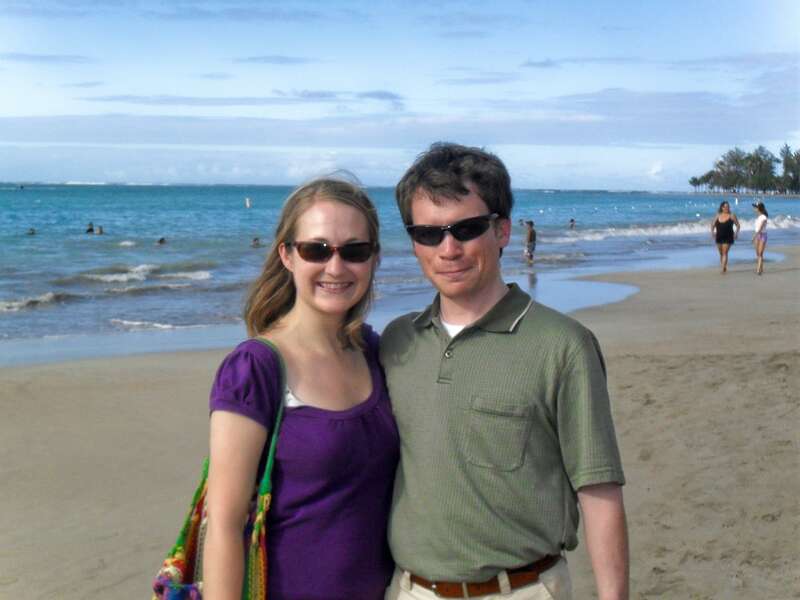 Lori and I followed the sun to the island commonwealth of Puerto Rico for our 2011 spring vacation. Get caught up by reading the beginnings of our Puerto Rico island adventure and stroll around Old San Juan. 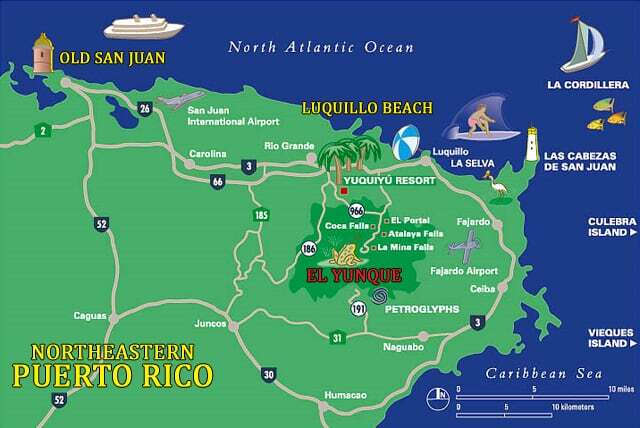 After a leisurely Sunday stroll through Old San Juan, we took to the road, driving first to Luquillo Beach for lunch at the famed Luquillo food kiosks and a quick stroll along the white-sand beach, then down the eastern coast and up to the south side of the tropical rain forest of El Yunque. 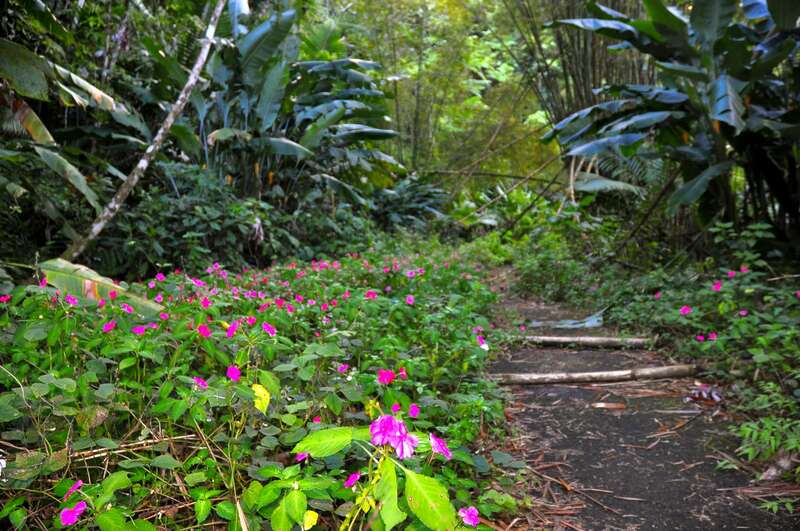 Prior to the 1970’s, the south side of El Yunque (known then as Caribbean National Forest) could be accessed from the north entrance, as the main highway 191 traversed the entire park from north to south. A landslide in 1970 changed all of that, permanently closing a large portion of the highway to vehicle traffic. 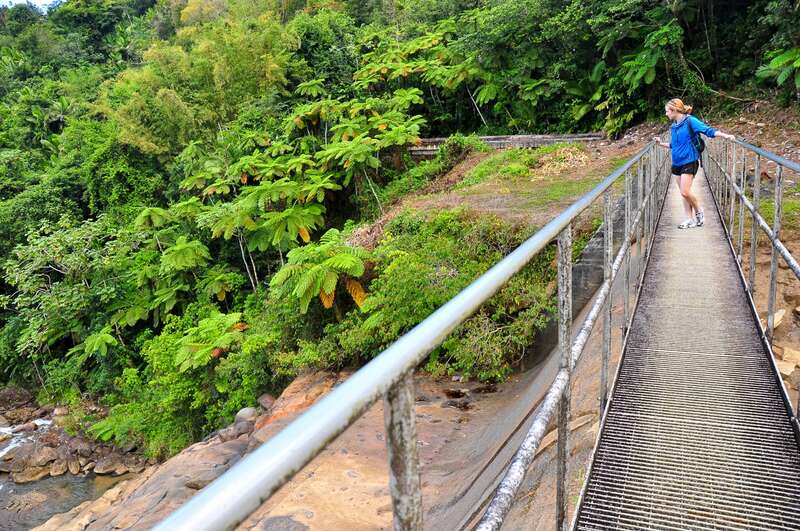 This creates a bit of a challenge for many visitors who wish to spend the night amongst the sights and sounds of the rainforest, as most of the park sites for which El Yunque is famous are located on the north slope, and most, if not all, of the lodging is locating on the south slope. As a result, we decided to spend Sunday night on the south slope, and visit the north slope later in the trip. We had heard through friends that Luquillo Beach, and especially its kiosks, were a must see/eat en route to the east coast. We were a bit unprepared, however, for the sheer number of Puerto Ricans we were about to encounter, enjoying a Sunday at the beach and loving life. As much press as Luquillo gets, it was refreshing that we were certainly in the minority at this particular beach. Every square foot from the access road down to the water (about 100 yards) and the length of the beach were claimed by families, barbecues, cars and more cars. 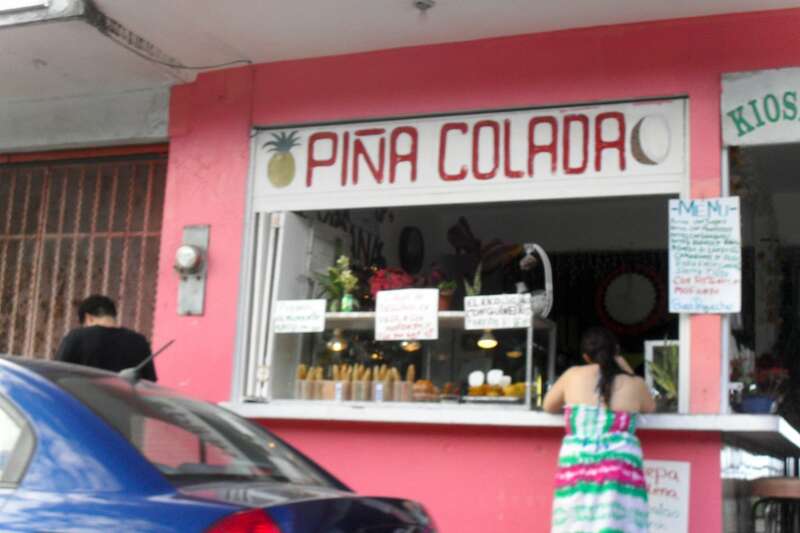 This was clearly the place to be and be seen on a Sunday afternoon, and we had heard that Luquillo was a popular destination for San Juan city slickers. I have to say though, that as much as I like hanging with the locals, it was a bit overwhelming…and the music was LOUD. It seemed that each suped-up SUV was trying to out-do the one next to it, some having entire cargo areas packed top to bottom, left to right with 12″ speakers, perhaps a dozen per car. A fairly tame Luquillo Beach as most beachgoers seemed to prefer staying close to stereo and grill back from the crashing waves. We chose our lunch by walking down the long line of food kiosks and picking one at random. We picked the one above for its most edible-looking offerings in the glass case. We grabbed three items based on the recommendations of two guys working the counter, and a couple of Medalla Lights (the national beer), found a table and dug in. I usually love local fried foods wherever I go, but sadly, these were pretty bad. The seafood something-or-other smelled awful, and the “meat” fried empanada-looking thing had a pretty fowl taste to it. Not ones to throw away food, we did our best, though the trashcan won out in the end. While the beers were cold and helped wash away the smell and taste, the disappointment lingered. The beach soon beckoned and we weaved through the maze of charcoal Webers and thumping 4x4s to the beach, which was billed as one of the island’s finest. Though we could appreciate the fact that everyone seemed to be enjoying themselves – probably more so than 99% of the rest of the human race at that particular moment – it somehow served to detract from the magic of the famed white sands and turquoise sea, for which deep appreciation was hard to muster. Runners in a mid-afternoon marathon making their way down Highway 3. 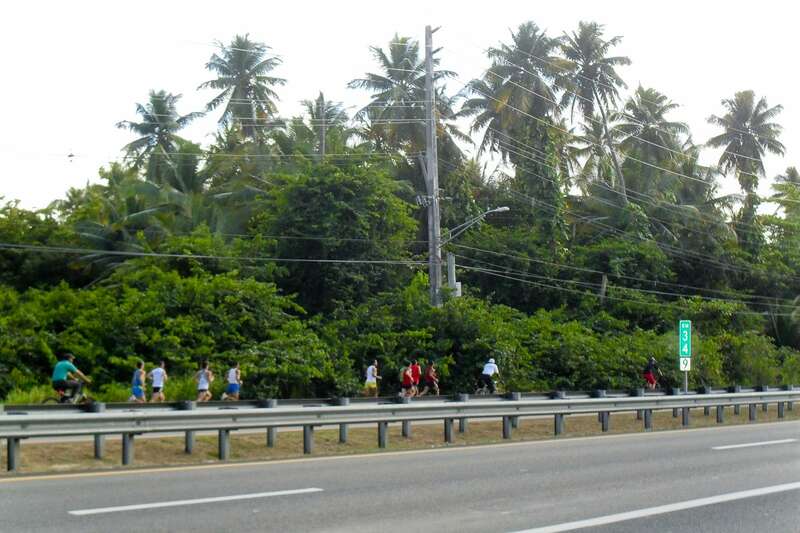 After inching out of the parking lot (which took about 20 minutes) we were confronted by the unlikeliest of afternoon images on the main highway – a marathon in full swing! A stark contrast to the scene on our side of the road. Mind you, it was mid-afternoon and temperatures were well over 80 at this point. We had no idea how far into the 26.2 miles these unfortunate souls had made it by this point, but we knew it was a marathon from the banner on the lead camera truck, and it was painfully obvious that not everyone in Puerto Rico was loving life on this particular Sunday. 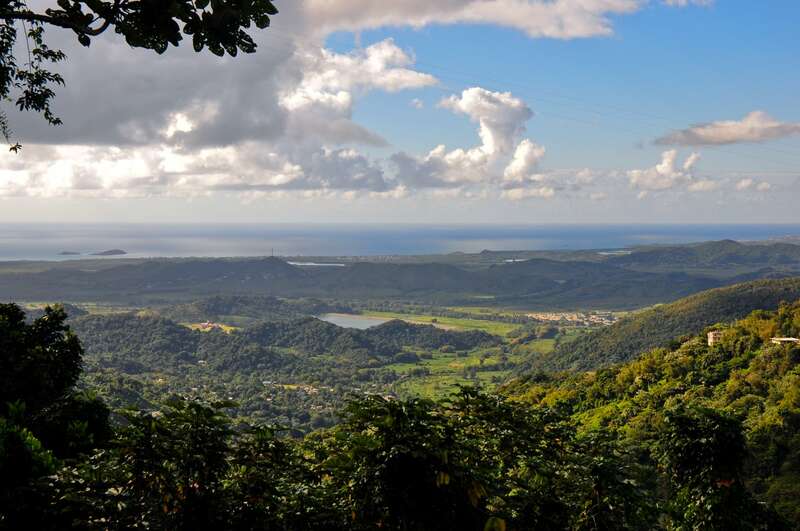 View from our private porch at Nelson’s Country Home on the south slope of El Yunque. Turning off the Autopista (highway) and onto 191 north was the beginning of our first real test driving in PR. This drive introduced us to the 1.5-lane-wide road with no center line. Driving such narrow roads can be challenging even under the best conditions, but take away the entire shoulder and add a sprinkling of potholes, a fair amount of large trucks, some wicked hairpin turns and some tropical rain and you got highway 191 (south-half). Shortly before arriving at Nelson’s Country Home, we spotted a half-naked man on the side of the road, curled over and appearing to be in distress. The man was clutching his chest/stomach in a way that suggested he might be suffering from a heart-attack, stab-wound, or something along those lines, so I slowed to see if he needed help. We yelled out to him to see if he was alright. He slowly uncurled and sat up straight, raising his arm above his head, and giving a sort of psychotic grimace that terrified Lori and gave me the creeps. He seemed to mumble something in English along the lines of “O.K.” while waving us off before collapsing face down on the ground. Lori yelled at me to “Go!” and so I did, but as freaky and psychotic as the guy appeared, I couldn’t just drive away. We stopped at a restaurant about 100 yards up the road and notified the woman there who replied in Spanish “Yeah, I know. It’s all fine. He’s very drunk.” Very indeed! So we continued on up the hill to our country home, glad that the dude hadn’t really been stabbed or anything like that, which certainly would have changed the tone of our secluded stay high up in the mountains. On a list of “Things you don’t want to hear before a night of staying in a rural cabin alone and day of hiking in the woods,” I’d think that “Crazy stomach stabber on the loose” would be near the top. 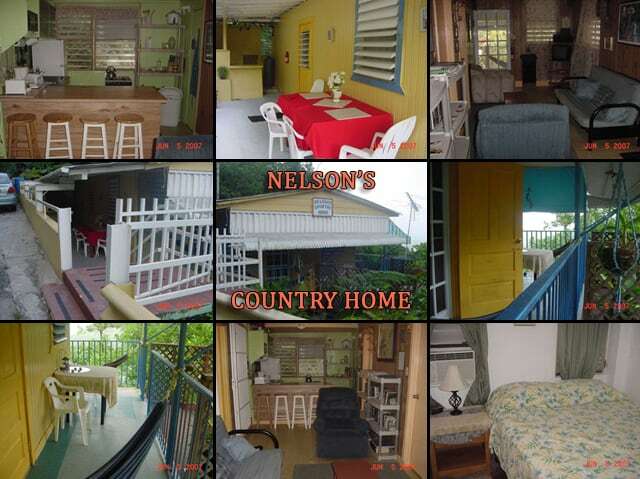 Nelson’s Country Home, El Yunque South Slope, PR. 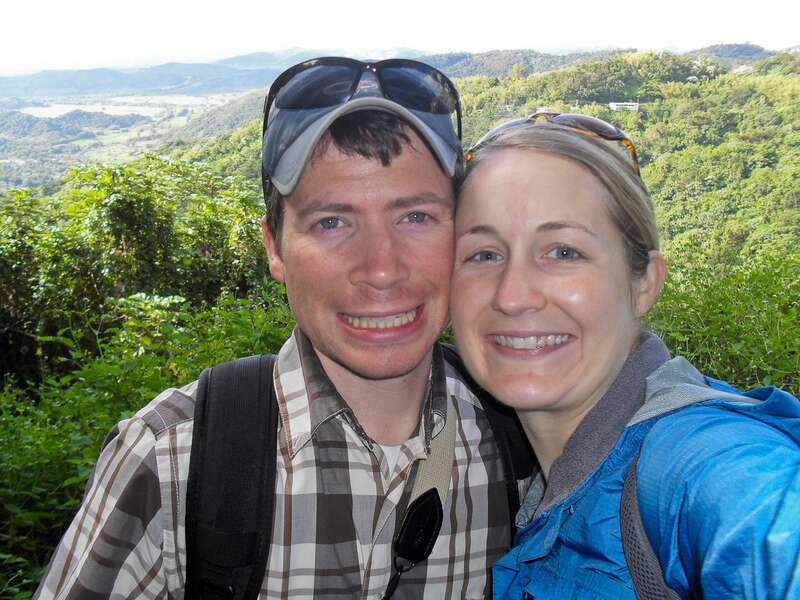 We originally had looked into staying at an eco-lodge farther up the road called Casa Cubuy, which was run by an American couple, but ultimately opted to go with Nelson’s Country Home due to cost (it was far cheaper) and the fact that we got the whole place to ourselves. The home has a separate unit in the lower level but it was unoccupied on this particular night. It is essentially a fully functional house, with kitchen, bathroom, living room, two bedrooms and back porch – the place could easily accommodate a family. Apparently, the place was built by a couple for their adult son, Nelson, and his new bride. The marriage soon fell apart, the house was rented out to tourists Nelson moved into the basement…hence, Nelson’s Country Home. Jackie, Nelson’s mother, met us upon arrival with keys and a hand-written map to the forest trails and swimming holes nearby. She gave us a tour of all of the amenities and provided play-by-play instructions for accessing the trails. She was very thorough and detail oriented but confessed that she, herself, hadn’t actually visited the trails and swimming holes in years, but was quite adamant that little had changed and that it was very difficult to get lost, unless one doesn’t follow the map of course. After checking in, we drove up the road a bit to Casa Cubuy’s restaurant, which is located about a half mile from their lodge. 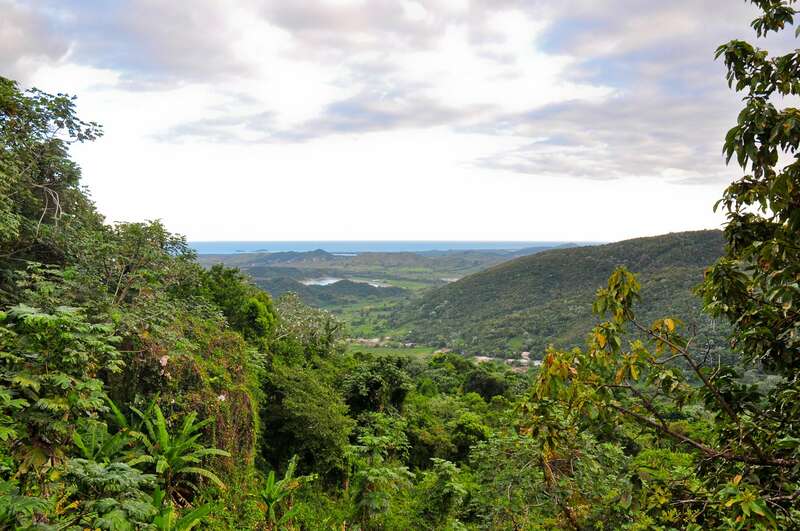 It’s a no-frills, concrete, open-air space with magnificent views of the rainforest, though we had to move away from the edge after about 15 minutes (Piña Colada and Mojito in hand) as it was a brisk, drizzly evening and I hadn’t brought my jacket. We were one of two or maybe three small groups of people, the staff was friendly, and the food was tasty. We bought some beers to go (for relaxing on our back deck) and headed back to Nelson’s shortly after nightfall. 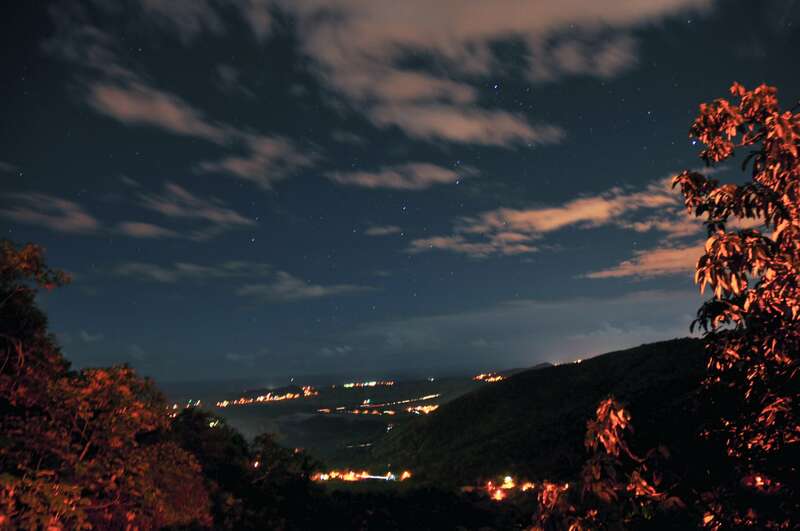 Back at Nelson’s we watched the stars peak out and the lights come on in the distant valley. 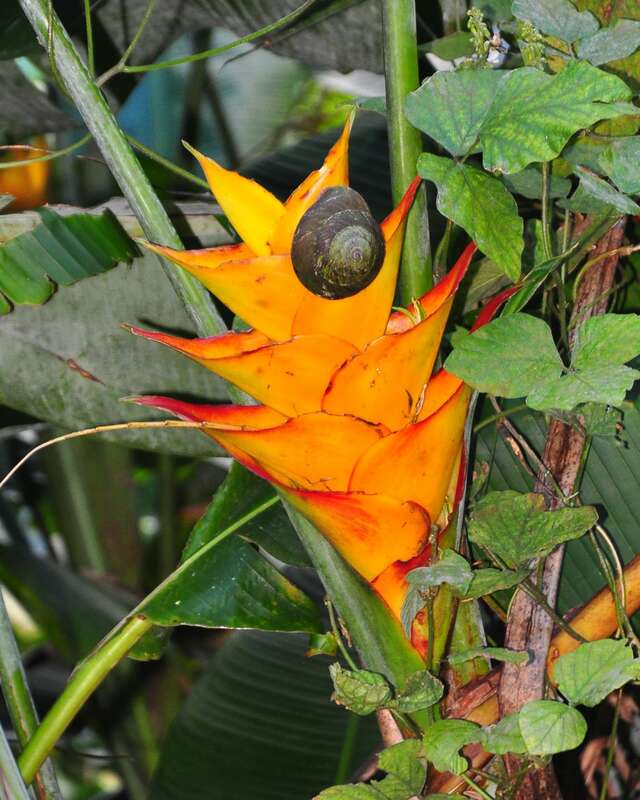 The area is beautiful, but it is the sound of the Coqui frogs that really sets the area apart. 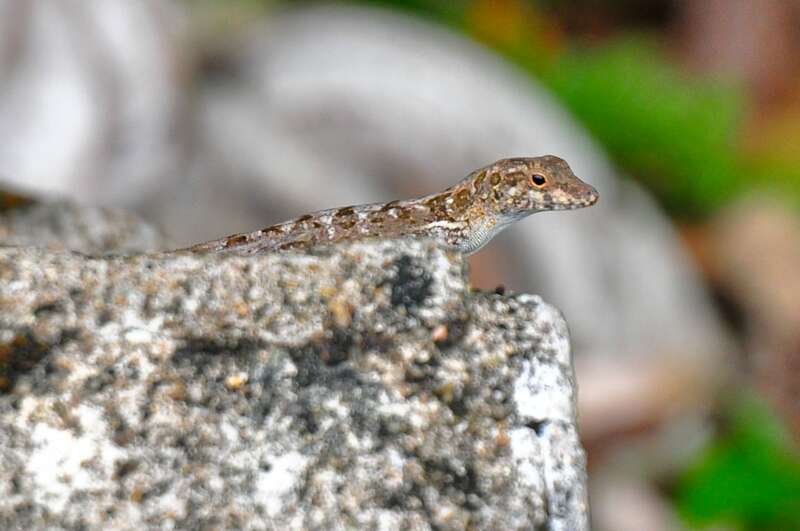 The Coqui are named for the croak that the males make, which sounds like “Co-QUI! Co-QUI!” and the symphony of many Coquis together is quite soothing. 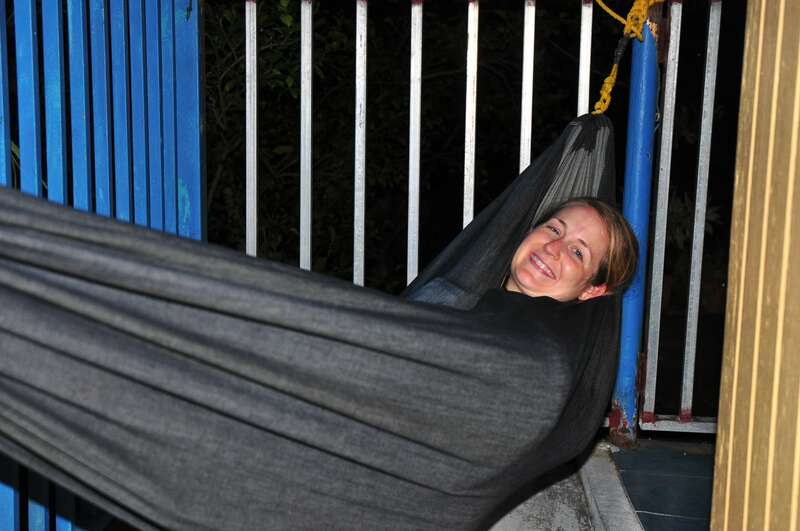 Relaxing in a hammock on the back deck to the sound of a Coqui Frog Symphony. Starlit view of the South Slope from our back deck at Nelson’s Country Home. 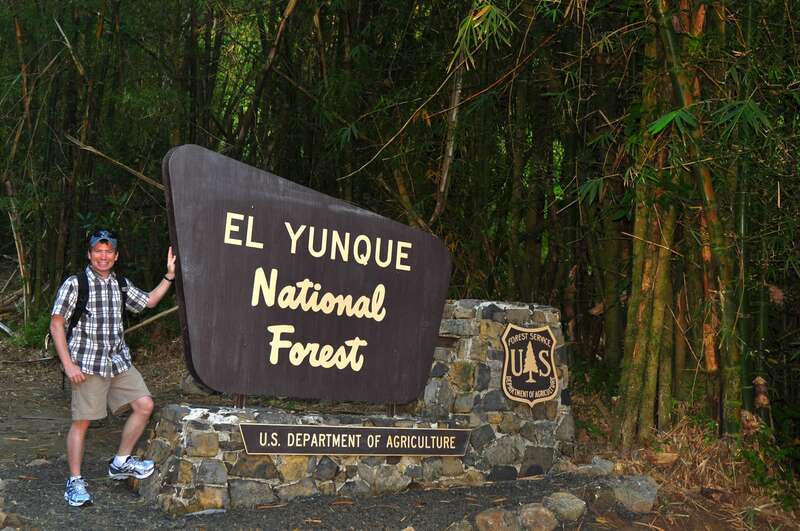 Entrance to El Yunque (formerly Caribbean) National Forest. 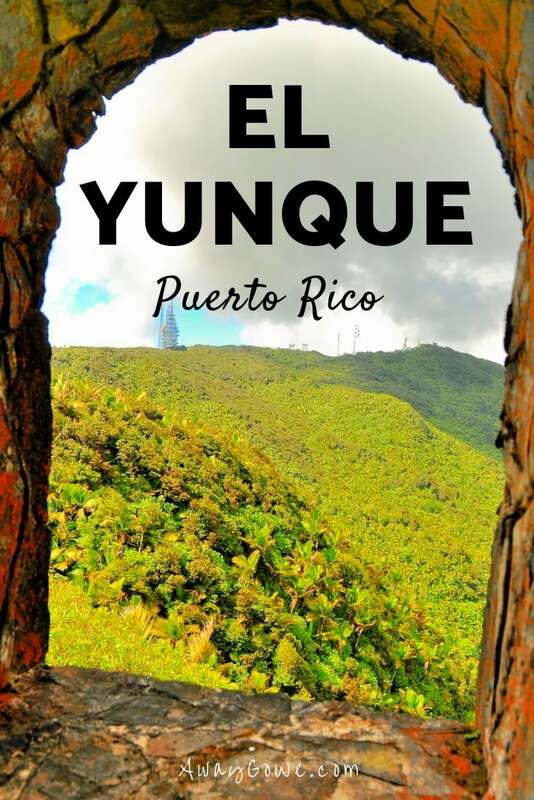 The South Slope of El Yunque is much less traveled than the North Slope and feels much more remote. We set out early in the morning driving up the mountain to the end of the road. We had hoped to arrive at the trailhead just around sunrise, but had missed it by about 45 minutes. The weather during the day dramatically alternated between brilliant blue sky and quick moving cloud cover (and showers), but hey, that’s what happens in the rainforest… Some of the downpours came on suddenly, taking us by complete surprise, though the huge Bamboo trees provided excellent cover. 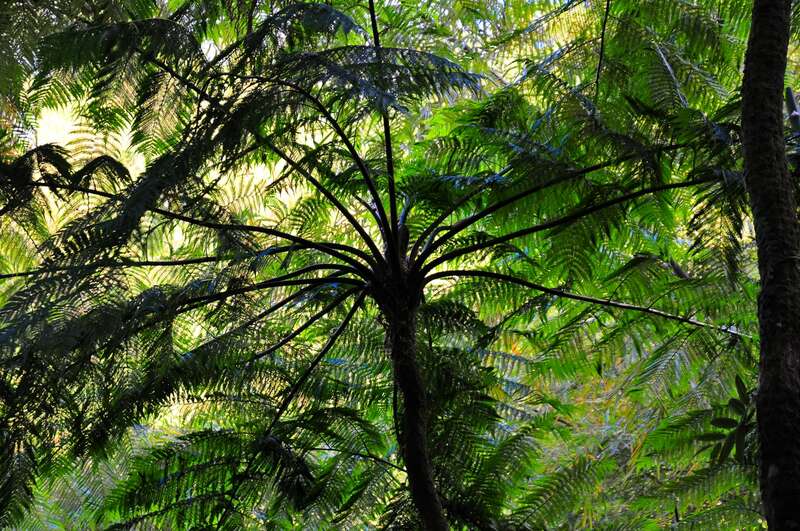 It was cool to be wandering around a rainforest with no one else around. We mused about how others back home might be spending their day and felt very fortunate to have nothing planned for this particular day but to walk around and enjoy nature. Lori and I were both quite excited to view the rainforest waterfalls and swimming holes that Jackie had told us about. 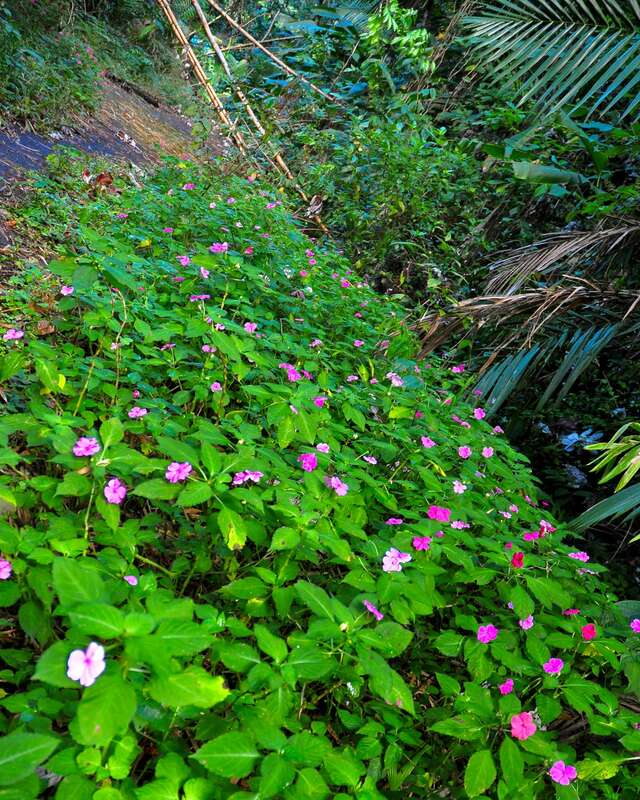 I had seen pictures of crystaline cascades crashing into pristine turquoise water – lush, green vegetation and exotic birds encircling – from places like Jamaica or Dominica and honestly expected to stumble upon something similar here in Puerto Rico, and why shouldn’t I? We tried our best to follow the hand-written map we had to the letter, which made sense for about as long as there was still a highway to follow, which really wasn’t all that long. We parked at the gate to the National Forest (that didn’t open until 9am) and hoofed it the rest of the way. Jackie had told us of a trail to a waterfall and a great little swimming hole near there, just up a concrete trail from the gate. We followed the trail and arrived at some water rushing over a concrete slab with unsettling bright orange signs cautioning people against any sort of “aquatic” activity in the area…hardly what I had imagined, but there were more waterfalls and swimming holes to be discovered, and the day was still young. 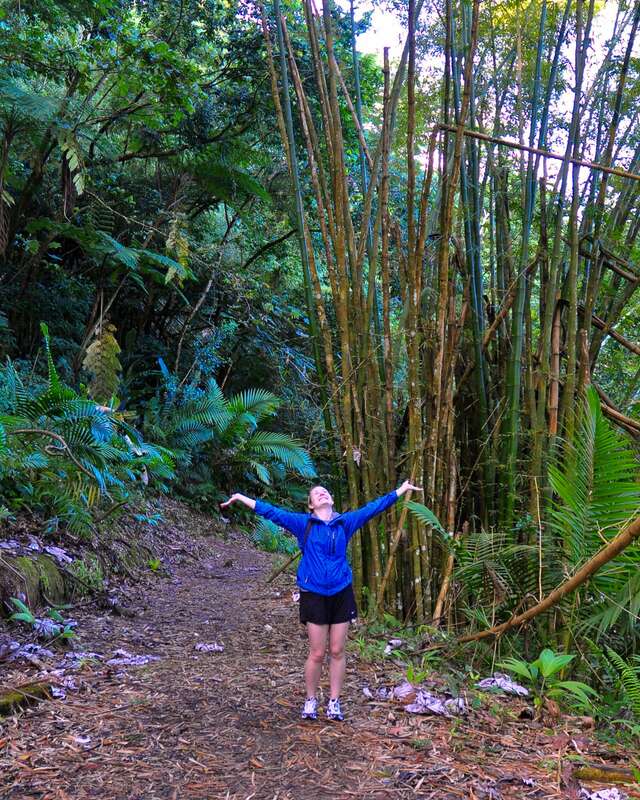 The first mile or so of our hike followed the freshly laid tarmac of highway 191’s short El Yunque National Forest stretch on the south slope. 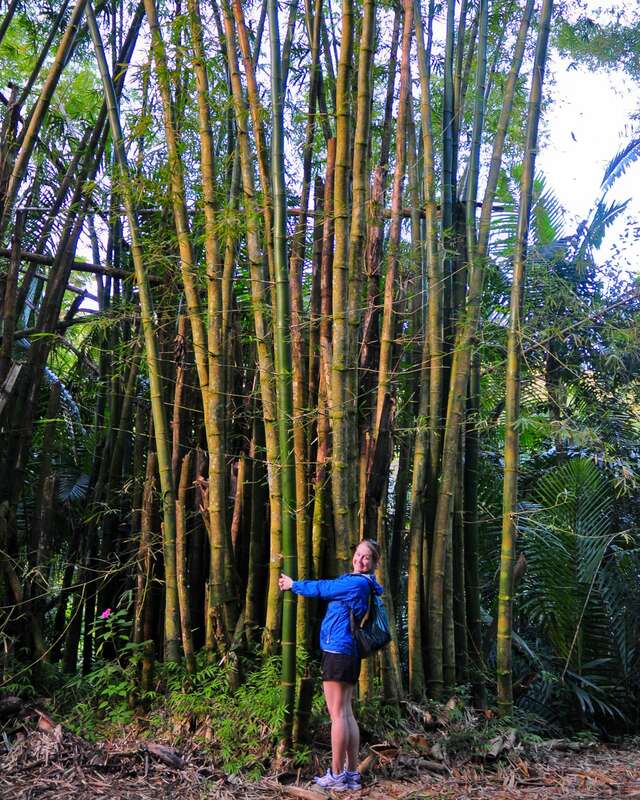 Lori loves the sound of bamboo swaying in the breeze. 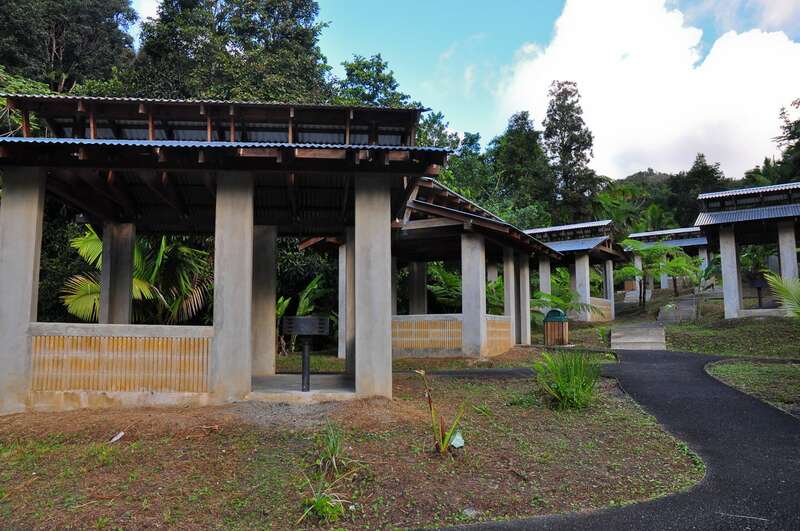 We were very surprised to find this brand new picnic complex in the middle of a rainforest. Later, we learned that the grand opening happened the day after we left. On our way back out of the park that day, we passed a very large truck hauling picnic benches…apparently arriving just in time. So, again, this is where the hand-written map begins to fail us. Our very friendly host Jackie had told us that this part was very easy. 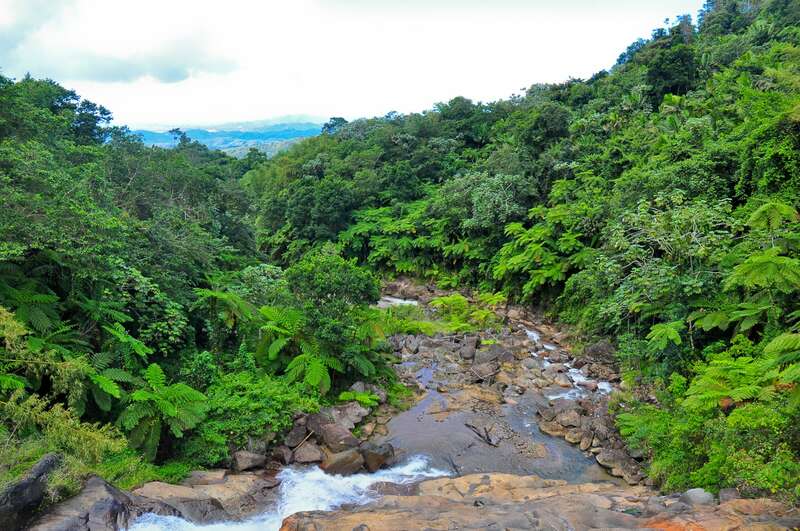 We would cross a bridge over the Rio Sabana and there would be a well-traveled trail immediately to our right which follows the river for some time. However, when we arrived, the only thing Lori and I spotted was a trail that continued straight, and, to our right, where Jackie’s trail should have been, an imposing steel gate with a large sign clearly indicating that no one but authorized personnel were allowed beyond. We were confused. Jackie definitely had told us to continue in this direction, and only this direction. She made it very clear that any other way would get us lost, and that it was very easy to get lost. But 191 clearly continued as a trail, and the only other option was scaling a seemingly impenetrable steel gate, so we continued straight. Hiking along the ghostly remains of Highway 191. Continuing beyond the parking lot, following the old, overgrown tarmac that once linked up to the North Slope is a bit of a creepy experience. 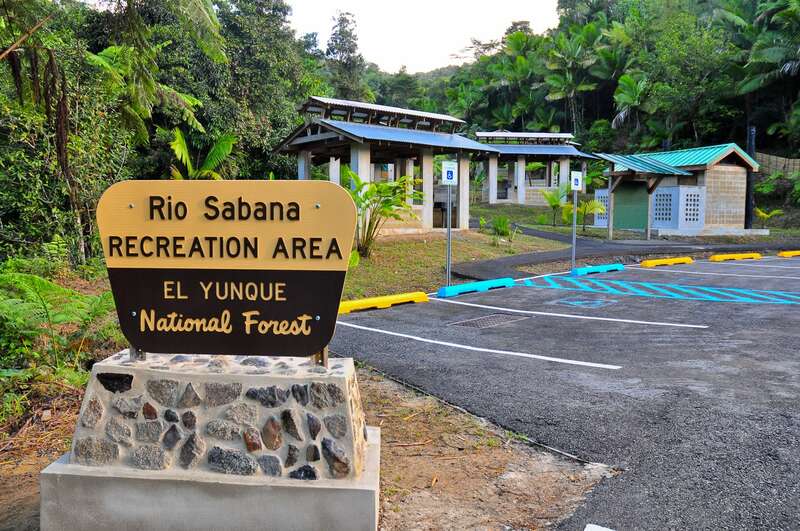 You’re essentially walking along, what was 40 years ago, a well-used highway linking the north and south entrances of Caribbean National Forest and the associated park. In 1970, a devastating landslide wiped out several miles of the roadway. This stretch of highway was, in fact, so prone to landslides and so unstable that soon after the 1970 disaster, the U.S. government decided that it was not worth rebuilding. So they blocked off the highway to the south and several miles to north and let the forest reclaim the abandoned segment. Wildflowers thrive on this abandoned segment of Highway 191. Now, there often comes a point when a hiker begins to question whether or not they are following the right path. For us, that moment came when our map indicated that we should have been following a pipeline along a river and we clearly had seen no pipeline or river. Our suspicions were confirmed when the tarmac completely ended and we found ourselves climbing higher and higher on a vast expanse of mud and grass. We had reached the mudslide, which was quite a distance from where we were supposed to be. The terrain quickly became rougher, and having neither prepared for such a hike nor an idea of how far up into the mountain the rough path would lead, we opted to turn back. 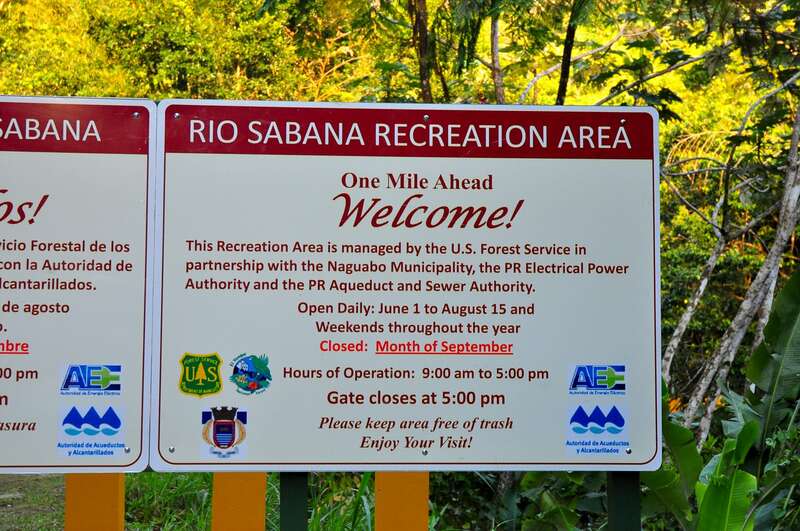 Some time later, we reached the parking lot of Rio Sabana Recreation Area again, this time noticing a clearing in the trees to our left that led to a trail. We thought we’d give it a shot and sure enough, we found ourselves on the other side of the steel gate, walking along a pipeline and a river. Indeed, Jackie had not been up here for quite some time. 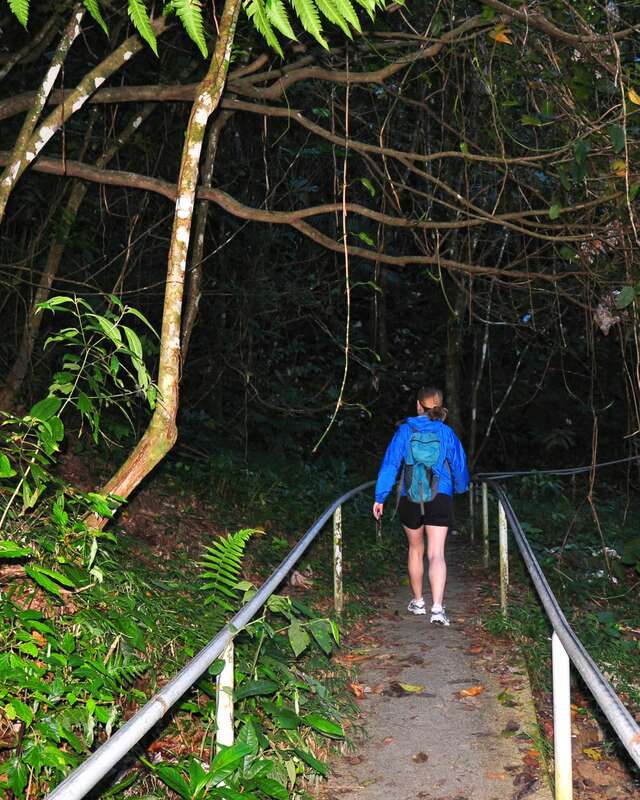 Certain that we were now following the correct path, we were very excited at the prospect of finding the tropical waterfalls and swimming holes that our host and others had spoken of. The map marked the best ones and we came upon the area where the first “waterfall”/”swimming hole” was supposed to be, which in reality consisted of a murky concrete pool with an intake pipe that fed water down to a lower concrete pool. We looked at our map. Then back at the pool and the water coming out of it. It was some kind of industrial hydrological operation. It was not beautiful. It was not pristine. And we would certainly not be going swimming there. The large, bright orange “DANGER” signs didn’t help much either. 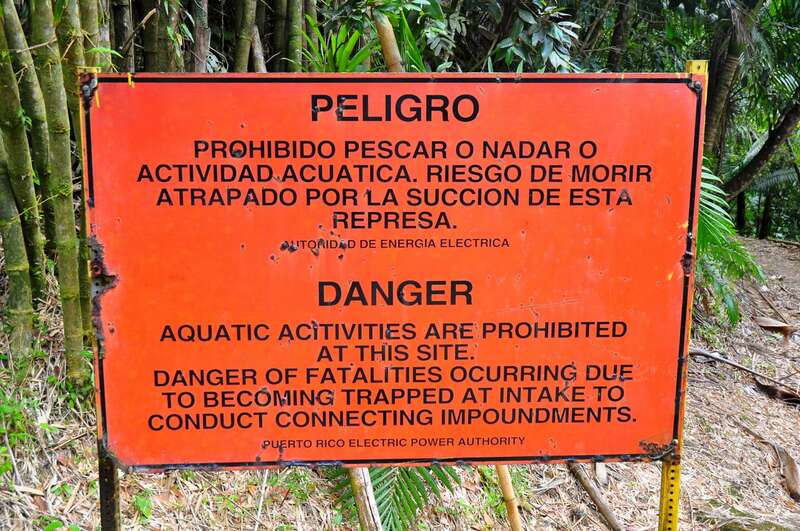 The phrase “Danger of fatalities occurring due to becoming trapped at intake” doesn’t exactly inspire confidence. A bit creeped out, we pushed on. The map had promised a large waterfall viewable from a bridge at trail’s end, so we were intent on getting there. 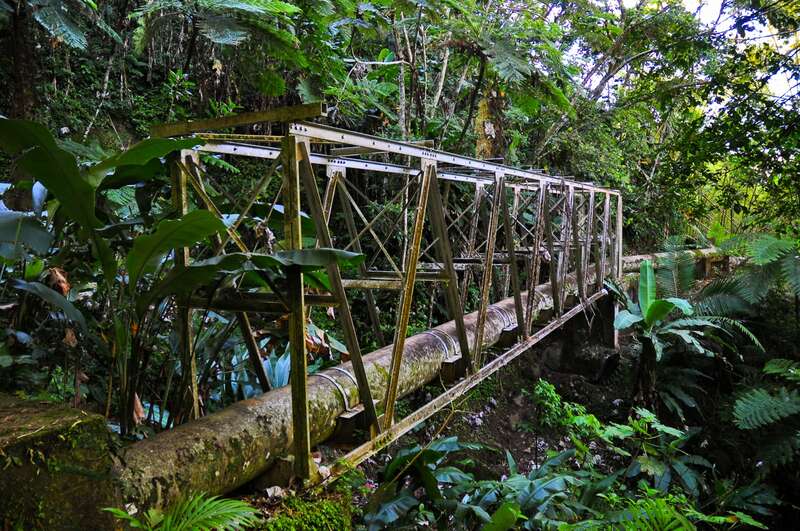 One of the bridges crossing the Rio Sabana along the trail. The pipeline we were told to follow as not to lose our way. Waterfall or no waterfall, it was a scenic hike. 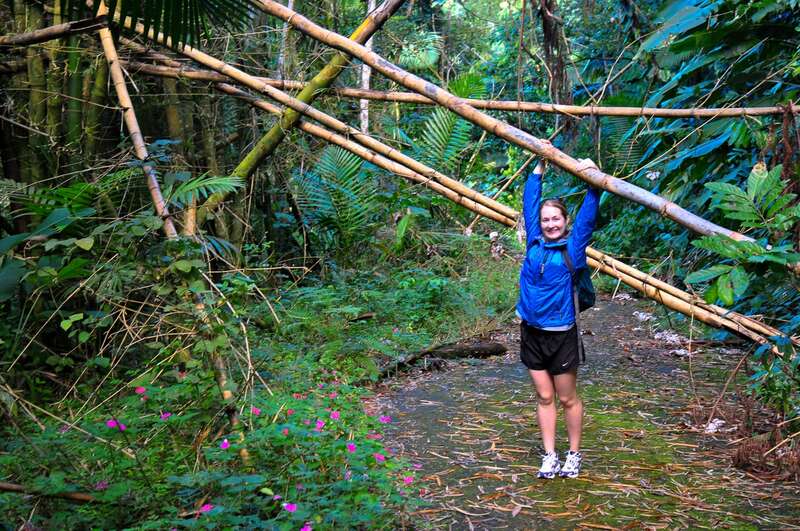 It was unique in the sense that Lori and I essentially had this particular part of a rainforest all to ourselves. Apart from the handful of workers we ran into on the way back, we didn’t see a single soul along the way. After a couple hours of hiking, through sun and rain, losing the trail and finding it again, we arrived at our destination. The magnificent, pristine, tropical, idyllic…WAH? The waterfall and swimming hole at the end of the trail. What is that? I mean, really! Because it ain’t no tropical waterfall, and it’s certainly not a swimming hole. 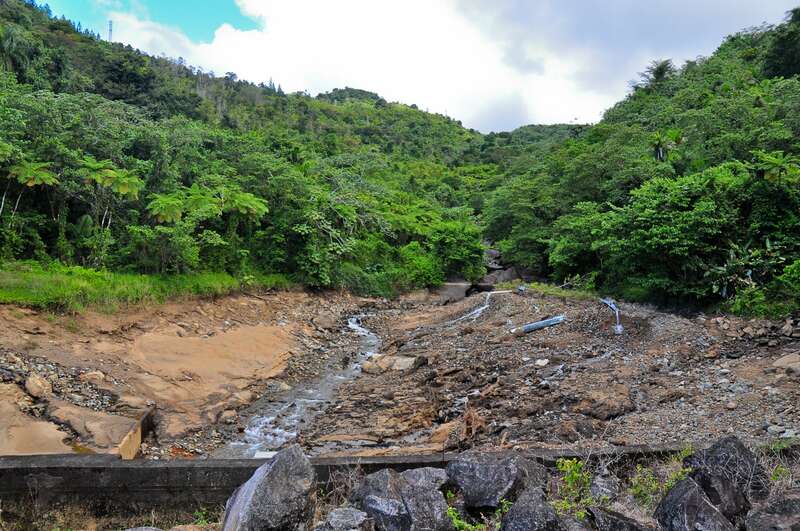 It was a dried up creek bed with a dozen or so plastic pipes feeding water into an anemic looking hydroelectric dam. 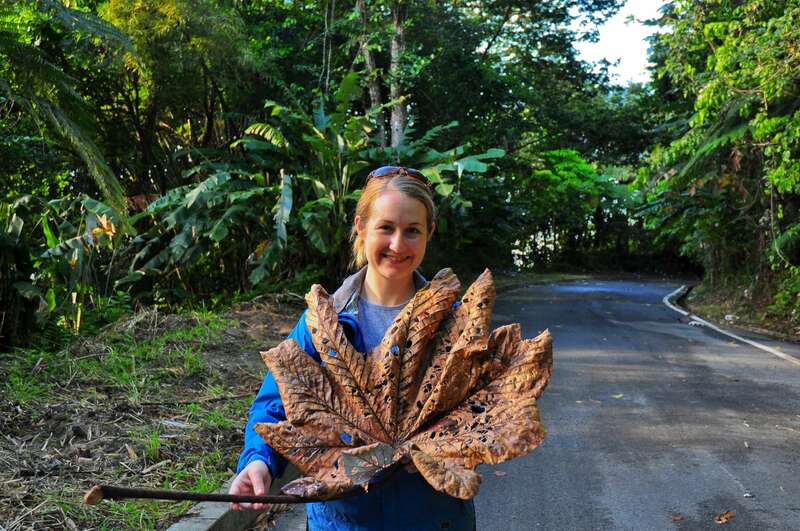 Granted, we were a month or two out from the rainy season, but it was not exactly what we were expecting…at all. It was not the jawdroppingly romantic spot I had envisioned, which, strangely enough, greatly pleased me as I had opted to safely leave behind one particular piece of precious cargo that morning (explanation forthcoming). 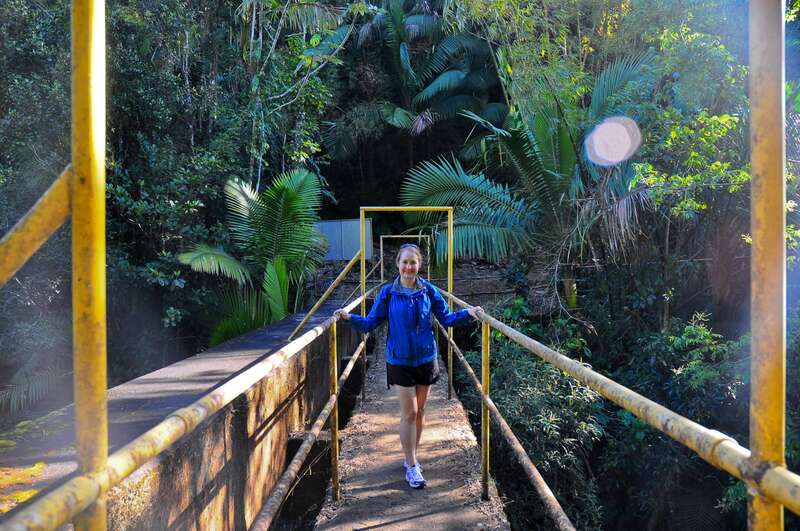 Lori peering over the edge of the bridge over a hydroelectric dam at the end of the trail. We tried to find beauty in it, we really did. We tried to imagine what it might look like at the height of the rainy season, but problem is, it still wouldn’t be any sort of place one would want to take a leisurely swim, certainly not during the rainy season when the water is mud-brown and rushing madly down the mountain carrying everything in its path. We spent a few minutes poking around before heading back. The rain had managed to hold off until right before we reached the car, and then the skies opened up and we watched the deluge pound the landscape from the dry side of the windshield. We headed back to Nelson’s, washed up, packed up and made our way back down the South Slope to the main highway. 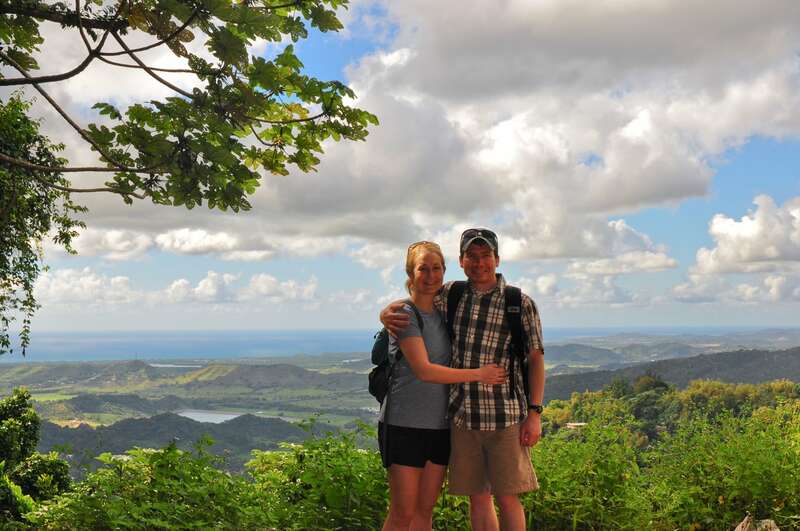 We were catching a ferry to the island of Vieques at 1pm and had some driving to do. This has been SO much fun to read! I’m one of Lori’s friends from college, and i’m just so happy for you two. Thanks for documenting your trip so well for all to enjoy!! David, what an exciting trip! It warms my heart, that you are able to experience such wonderful places! You are so lucky to have found the secret of a good life and with a Partner like Lori, LA DOLCE VITA ! I do hope one day you will have all of your journals published ! Africa, South America, and all your other adventures and I am sure there will be many more to come. You and Lori look like such a perfect Pair! She is a very special young lady , I think you and she will have a great life together.